You thought 2011 was tough? Spain's new conservative government has outlined 8.9bn euros ($11.5bn, £7.5bn) in new spending cuts and tax rises to lower the country's borrowing. The announcement is the first in a wave of austerity measures, with a total of 16.5bn euros to be cut in 2012. It also said Spain's 2011 deficit will be about 8% of its output - higher than the 6% seen by the previous government. The Popular Party last month ousted the Socialists from power at elections amid deep economic gloom. The government of new Prime Minister Mariano Rajoy has vowed to meet Spain's target of reducing the public deficit to 4.4% of gross domestic product in 2012, no matter what. On Friday, Deputy Prime Minister Soraya Saenz de Santamaria maintained a freeze on public sector wages for another year and ruled out practically all government hiring. "This is the beginning of the beginning," Ms Saenz de Santamaria said. "We are facing an extraordinary, unexpected situation, which will force us to take extraordinary and unexpected measures." Taxes on the wealthiest Spaniards will also be raised for at least two years, raising 6bn euros, she said. Spain's borrowing costs have jumped in the last year - reaching as high as 6.7% for 10-year debts - as investors feared that Spain might join Greece, the Irish Republic and Portugal in needing a bailout. The country's economy has shrunk sharply since a housing bubble burst in 2008, and it has an unemployment rate of 21%, the highest in Europe. 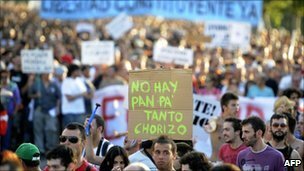 The austerity measures have sparked a number of large protests across the country. People Can Fly has created a wildly fun first-person shooter that looks gorgeous running on the latest Unreal Engine 3 technology, and the skillshot system. History often harks back to dazzling moments rather than day-to-day drabness, argues historian Lisa Jardine. 2011 will be remembered as the year that ushered in a new age of austerity. From 4 January, when VAT increased from 17.5 to 20%, we all felt that little bit less well off, and things got worse as the year wore on. For my generation, "austerity" is a word with a very particular ring to it, permanently associated with the rationing regulations introduced during World War II. Sweet rationing did not end until 1953, and I have intense childhood memories of my mother counting out our scanty sweet allocation from a biscuit tin on the kitchen draining board once a week. It is probably why I am also of the generation that has an irresistibly sweet tooth to this day. Clothes rationing had a particularly dramatic effect on how women of Britain looked in the 1940s. 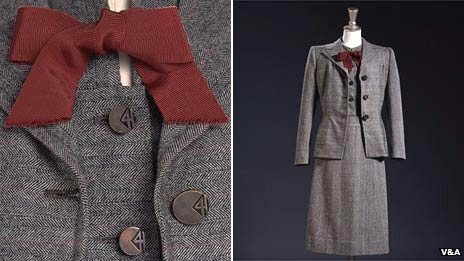 Items of clothing were identified by the CC41 label (civilian clothing 1941), guaranteeing that they conformed to the government's frugality regulations. In 1942 the Making of Civilian Clothing (restriction order) was passed. This prohibited wasteful cutting of cloth, and set a list of restrictions that tailors and dressmakers had to work to. Dresses could have no more than two pockets and five buttons, six seams in the skirt of a woollen dress, two inverted or box pleats, or four knife pleats. No unnecessary decoration was allowed. Yet, if 2011 began the age of austerity, it was also the year of Prince William and Catherine Middleton's glorious Royal Wedding. And that had everything to do with glamour and opulence - especially the wedding dress, lovingly designed in total secrecy by Sarah Burton, successor at the fashion house of Alexander McQueen. No economising there - indeed, a positive luxuriating in glamour and excess. The dress was ivory and white satin gazar, its skirt, according to the designer, echoing an opening flower, with an abundance of pleats, buttoned with no less than 58 gazar and organza-covered buttons down the back, and a train measuring almost 3m. I unashamedly confess to having followed every detail of that dress on the day - watched the entire wedding ceremony, gasped at the extravagance of it all, devoured every morsel of information testifying to the expense in terms of materials and labour. I didn't queue for hours to see the dress itself at Buckingham Palace later (displayed next to the equally astounding multi-tiered wedding cake), but I have friends who did, and who tell me that the real thing lived up to all our expectations for the exquisite detail of its handmade, hand-appliqued lace. Remember, those who worked applying it had to wash their hands every 30 minutes and use a new steel needle every three hours to avoid marking the ivory silk. In spite of the gathering economic gloom, many of us - from all walks of life and every economic bracket - embraced the pageantry and sheer opulence of the Duke and Duchess of Cambridge's lavish wedding. We treated the bank holidays as an occasion for celebration, of coming together in the streets and in private in an outpouring of, yes, national pride. And there is plenty of historical precedent for our doing so. In 1558, when the Protestant Queen Elizabeth I succeeded her Catholic sister Mary to the throne of England, royal finances were in a parlous state. Although Elizabeth's fiscal restraint cleared the regime of debt by 1574, the costs of warfare in the later decades of the reign obliterated the surplus, and England had a debt of £350,000 at Elizabeth's death in 1603. Against this economic background, Elizabeth used ostentation and opulence in her dress as a political tool to increase national confidence in the solvency of her regime. We know how systematic and thought-through such a strategy was, because some of the account books keeping track of the outlay of precious gems and sumptuous fabrics on important public occasions have come down to us. One of these little books, kept by Elizabeth's senior lady-in-waiting in charge of her "Wardrobe of Robes", contains a daily inventory of outfits worn by her, and is engagingly entitled "Lost from her Majesty's back". It details meticulously the pearls and gems individually stitched on to the queen's articles of clothing for state occasions, then painstakingly removed and checked back in to her jewellery collection afterwards. If a gem became detached in the course of the outing it had to be accounted for as a "loss" in the book, and the ladies of the royal household were held responsible for recovering it. What this tells us is that the extraordinary outfit Queen Elizabeth wears in a classic portrait like the 1588 Armada portrait - painted to celebrate the defeat of the Spanish fleet - is no artistic exaggeration. At each intersection of patterning in her silk sleeves and kirtle a pearl or a flower-shaped jewel with diamond petals has been lovingly attached, while shoulders and gown-edge are decorated with pink silk bows, each with a jewelled flower at its centre. The effect is dazzling - a clever way of making a female monarch appear as powerful in victory as her male counterpart would have been, dressed in full armour and ready for battle. In 1581 Sir Christopher Hatton, then Vice-Chamberlain gave: "A jewell of gold, being an amulet, with a buckle and pendant of gold, garnished and furnished with diamonds and rubies, six pieces of gold enamelled, fully furnished with small rubies. Betwixt every of the same pieces, 13 pendants of gold garnished with small rubies and small diamonds. And more - 144 buttons of gold, peascod fashion, half part enamelled green." A year earlier the Countess of Lincoln gave: "A doublet with double sleeves, ash colour, upon tinsel laid with passmane lace of gold and silver, lined with yellow sarcenet." And from the Countess of Warwick, "a fore part and a pair of sleeves of white satin, embroidered with branches and trees of damask gold, two guards of black velvet, upon the fore part embroidered with gold, silver, and silk, set with seed pearl, and lined with tawny sarcenet." I said that Elizabeth herself lacked the means to support such display of financial extravagance. A significant way in which the queen consolidated the sense of economic security conveyed by sheer ostentation, was by means of a carefully constructed policy of gift-exchange with senior (and more personally wealthy) members of her court. On New Year's Day each year it was customary for the English of all walks of life to exchange personal gifts. Elizabeth and her advisers organised expensive gift-giving of elaborate pieces of jewellery and exquisite articles of clothing, seeing to it that the gifts offered to her at the new year were, from year to year, increasingly extravagant, and increasingly matched to particular requirements for Elizabeth's court dress, communicated to the gift-giver well in advance. If the gift succeeded - if the queen liked it and wore it - it had fulfilled its function of winning the queen's favour and confirming the giver's devotion and loyalty. In exchange, each individual presenting a luxury item would receive a piece of engraved silver plate (typically in the form of cups, bowls and spoons), which because it came from the queen herself, had a "value" far beyond its intrinsic worth. On the whole, male members of the aristocracy gave gems, while their female counterparts gave elaborately decorated clothing. The more powerful and senior the nobleman, the more intricate and ostentatious his gift. All these gifts were negotiated with, and presented to Lady Howard, keeper of the queen's wardrobe, whose sartorial guidance and approval was sought both before and after the New Year's Day present-giving. At formal events, glamour is important - jewels with a personal or state significance is a compliment to the host country, and the dress should ensure the wearer shines out among other guests "
Today, we look back to the Age of Elizabeth I as a Golden Age, in spite of the serious economic difficulties that faced the country throughout her reign. In large part this is due to the enduring impact of those glorious, triumphalist portraits - Elizabeth resplendent in precious stones and costly fabrics, every inch of her body decked out with finery. And it appears that our own monarch, Queen Elizabeth II, is bent on following in her illustrious forebear's footsteps. 2012 is the present Queen's diamond jubilee, and she and Prince Philip, the Duke and Duchess of Cornwall, and Duke and Duchess of Cambridge, will tour the Commonwealth in year-long celebrations. If the spectacular array of frocks and hats worn by the Duchess of Cambridge in Canada last year is anything to go by, pictures of opulent outfits - every last detail of daywear and eveningwear - will fill tabloid newspapers throughout. We may be in for years of economic hardship as a nation, but if history judges us by the recorded lavishness of our royal family's ceremonial outfits, perhaps ours too will look, retrospectively, like another Golden Age. Two people who pulled up at a McDonald's drive-through in western Illinois completely naked face public indecency charges. Police in Galesburg say a 19-year-old El Paso man and a 21-year-old Galesburg woman have been released from Knox County Jail after being ordered to appear in court to face the charges. WGIL Radio reports that the duo was still in the McDonald's parking lot when officers arrived just before 2 a.m. Wednesday. Police say the man was crouched over in the driver's seat trying to pull on a pair of pants while his passenger was covering up in a blanket. WGIL reports that the pair told officers the late night fast-food run might not have been a great idea but that they both still thought it was funny. Europe must cooperate more closely if it wants the euro to succeed as its shared currency, and it still has a long way to go to overcome its sovereign debt crisis, German Chancellor Angela Merkel said in her New Year's Eve address. She said that she would do everything in her power to strengthen the euro, but that this would only work if Europe learned from its mistakes. 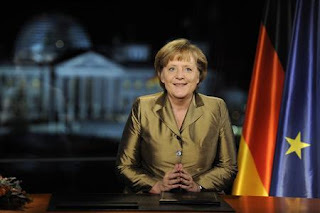 "A common currency can only really be successful if we in Europe cooperate more than we have done," Merkel said in a pre-recorded televised address to be broadcast on Saturday. "Europe is growing together in the crisis," she said, according to an official copy of her speech. "The path to overcoming this remains long and won't be free from setbacks, but at the end of it, Europe will emerge stronger from the crisis than it went into it." Merkel also said that while the German economy was doing well, next year would "without a doubt be more difficult than this one." Germany recovered swiftly from the 2008/09 financial crisis, but growth has eased in the last few months and many economists are now forecasting a mild slump for Europe's bulwark economy. Shaky Europe. Political gridlock. Volatile markets. Familiar themes for those who lived through 2011, and investors should be ready to revisit them next year. With a spiraling debt crisis in Europe, political upheaval around the world, and crumbling creditworthiness in major industrial nations, 2011 was a tough year to know where to invest. 2012 is unlikely to offer much respite. The S&P 500, a measure of the biggest U.S. companies' market value, spent much of the year getting pushed up and down, flummoxing shorts and longs - and scaring Moms and Pops away from stocks. It ended the year at 1,257.60, down a mere 0.04 of a point. But the S&P 500's tepid performance was encouraging, compared with other world equity markets. The United States may still be seen as a safe haven, though even that looks uncertain. For every rally built on improving economic figures this year, selloffs were never far away on worries the European debt crisis would eventually drag the continent into a recession and perhaps the United States as well. That could continue in 2012. China and other fast-growing emerging markets can no longer be leaned on as those economies slow. In 2011's last half, the poorest-performing sectors outside of banks were most connected to global growth - materials, energy and industrial companies. "There is a growing realization that the global economy is in jeopardy," said Bruce Bittles, chief investment strategist at Robert W. Baird & Co in Nashville. "There is uncertainty in every corner of the world." That uncertainty fed substantial volatility in 2011. Despite the S&P's flat performance this year, there were 66 trading days when stocks moved in a 2 percent range. In 2008, when Lehman Brothers collapsed during a global financial crisis, there were more than 130 trading days when stocks swung that much. But that led to a flight from equities by retail investors. U.S. equity funds had outflows in every month since May. More than $483 billion left U.S. mutual funds in 2011 through the year's second-to-last week, even though the U.S. market outperformed foreign stocks late in the game. The S&P 500 ended the year off a scant 0.003 percent, the closest it has come to unchanged since 1947, according to Standard & Poor's. The Dow Jones industrial average .DJI finished 2011 with a 5.5 percent gain, while the Nasdaq Composite Index .IXIC slipped 1.8 percent. In contrast, the MSCI world stocks index .MIWD00000PUS fell 9 percent, while the FTSEurofirst-300 index .FTEU3 slid nearly 11 percent. The darlings in the emerging markets fared the worst. China's Shanghai Composite index .SSEC lost 22 percent, India's BSE .BSESN sank 25 percent, and Brazil's Bovespa .BVSP dropped 18 percent. Strategists say the U.S. stock market may benefit from reasonable economic growth and attractive market valuation. The S&P 500 is expected to rise 6 percent by the end of 2012, according to the most recent poll of Wall Street strategists. When Wall Street gets back to work on Tuesday, it will face a holiday-shortened week and a slew of economic indicators. The most crucial numbers will come on Friday when the government will release the December non-farm payrolls report. Economists polled by Reuters expect a December gain of 150,000 jobs, compared with an increase of 120,000 jobs in November. Volatility is likely to persist through early 2012 because of the uncertainty in Europe and rising concern about slowed earnings growth due to recent revisions. The S&P 500's price-to-earnings ratio - what investors are willing to pay for a dollar of earnings - is under 12, below the 25-year average of 15. In weaker markets like Germany's DAX, the figure is below 9. "We're building in a massive recession into these numbers," said Marc Pado, U.S. market strategist at Cantor Fitzgerald & Co. in San Francisco. U.S. companies cutting earnings' outlooks recently outpaced those raising theirs by the greatest ratio in 10 years. Some sectors, such as materials, have seen a sharp drop in forecasts for the fourth quarter, Thomson Reuters data showed. Last week, downbeat earnings from Oracle Corp (ORCL.O) shook confidence in the tech sector's health before the quarterly earnings season's start in January. Oracle joined a growing list of companies, including some of technology's biggest names, whose results and outlooks have set off alarm bells. Next year, S&P 500 earnings are seen rising 9.9 percent, down from an estimate of 13 percent in October. Many economists believe the euro zone is already in recession. They forecast that the economies of the 17-nation bloc will stagnate in 2012 after contracting in this year's fourth quarter and the first quarter of the next. Investors are worried that Italy and Spain will have to keep refinancing borrowings at unsustainable levels early next year, which could escalate the crisis. The correlation between the U.S. stock market and the euro skyrocketed in 2011 as investors tied bets on risky assets to the euro's moves. That trend ebbed as equities rallied near the end of the year, but it is likely to flare up again. So far the U.S. economy has stayed on course for moderate growth. Economists expect it to expand by about 2.1 percent next year. But it is unclear how a slowdown in the rest of the world will affect the economy stateside. The key may be China rather than Europe. "China is the 800-pound gorilla in the room and is probably the most important country to watch in terms of their contribution to global growth," said Michael Sheldon, chief market strategist at RDM Financial in Westport, Connecticut. Chinese business confidence is weakening. A survey showed export orders fell for the first time in nearly three years. The drop in materials shares in 2011's second half reflects worry about declining activity overseas. The S&P Materials Index .GSPM lost nearly 14 percent in the last six months. One of the pivotal events of 2011 was the downgrade of the United States' perfect triple-A credit rating. Standard & Poor's cited congressional bickering as the reason for the downgrade. August's stalemate in Washington over raising the debt ceiling sparked a selloff that accelerated after the downgrade. Investors expect the gridlock in Congress to get worse as the U.S. presidential election approaches in November. The election is likely to be close, which will not make legislative efforts to tackle high debt levels and weak demand any easier. Rancor was in view again in December as Congress struggled to pass a two-month extension of U.S. payroll-tax cuts. "There will be less certainty about taxation and regulation so that will inhibit business formation and business growth," said Brian Battle, a trader at Performance Trust Capital Partners in Chicago. Goldman Sachs sees global growth highly susceptible in 2012 to even minor shocks - and those shocks may be political. "Slowing growth (and in places outright contraction), public-sector cuts, and a renegotiation of the social compact between state and society in different parts of the world is an environment ripe for political turmoil," Goldman said in a note to clients. Boeing Co beat out Lockheed Martin to retain its position as the prime contractor for the U.S. long-range missile shield, the Pentagon said on Friday. The U.S. Defense Department said it was awarding Boeing a $3.48 billion, seven-year contract to develop, test, engineer and manufacture missile defense systems. A team led by Lockheed Martin Corp and Raytheon Co had vied with Boeing to expand and maintain the Ground-based Midcourse Defense, or GMD, hub of layered antimissile protection. Boeing partnered with Northrop Grumman Corp to retain the work. "We believe the government conducted a fair and open competition, making the right decision for the future of the program," Norm Tew, Boeing vice president and program director of GMD, said in a statement. Lockheed said it was "honored" to have participated on the bid, a company spokesperson said in a statement on Friday. 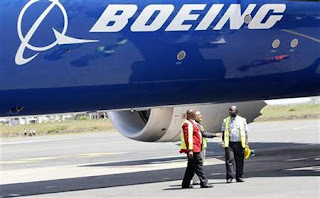 The GMD contract's value to Boeing will have been about $18 billion from January 2001, when it formally became the system's prime contractor, through the end of this year, Boeing has said. GMD uses radar and other sensors plus a 20,000-mile fiber optic communications network to cue interceptors in silos at Fort Greely, Alaska and Vandenberg Air Force Base, California. The shield has been shaped initially to guard against ballistic missiles that could be fired by Iran and North Korea. It is the only U.S. defense against long-range missiles that could be tipped with chemical, biological or nuclear warheads. Iran's senior navy commander denied state media reports that the Islamic Republic had test-fired long-range missiles during a naval drill on Saturday, saying the missiles would be launched in the coming days. Mahmoud Mousavi told Iran's English-language Press TV "the exercise of launching missiles will be carried out in the coming days." The semi-official Fars news agency had earlier reported that Iran had test-fired long-range and other missiles during the exercise on Saturday. Firefighters extinguished a massive fire aboard a docked Russian nuclear submarine Friday as some crew members remained inside, officials said, assuring that there was no radiation leak and that the vessel's nuclear-tipped missiles were not on board. Military prosecutors have launched an investigation into whether safety regulations were breached, and President Dmitry Medvedev summoned top Cabinet officials to report on the situation and demanded punishment for anyone found responsible. Russian state television earlier showed the rubber-coated hull of the submarine still smoldering, with firefighters gathering around it and some standing on top to douse it with water. Seven members of the submarine crew were hospitalized after inhaling poisonous carbon monoxide fumes from the fire, Shoigu said. An unspecified number of crew remained inside the submarine during the fire, Defense Ministry spokesman Col. Igor Konashenkov said in a statement. He insisted there never was any danger of it spreading inside the sub and said the crew reported that the conditions on board remained normal. Konashenkov's statement left it unclear whether the crew were trapped there or ordered to stay inside. There has been no radiation leak from the fire, the Defense Ministry and Foreign Ministry said, and Norway's Radiation Protection Authority across the border reported it has not measured any increased radioactivity. "There have been problems to get clear information from the Russian side," Gunnar Kjoennoey was quoted as saying. "We have an agreement to exchange information in such cases, but there has been no information from the Russian side so far." Russia's military says the blaze started on wooden scaffolding and then engulfed the sub's outer hull. The vessel's nuclear reactor had been shut down and its nuclear-tipped missiles and other weapons had been unloaded before dryadic repairs, it said. Toxic fumes from the blaze had spread to the town of Roslyakovo where the shipyard is located, but officials said there was no need to evacuate local residents. Per Strand of the Norwegian Radiation Protection Authority said they had received information about the fire through the Norwegian Foreign Ministry, after which they contacted the Russians themselves. "We have a warning agreement but we're working on also getting warnings for small incidents which the Russians do not believe will not cross the border. But we're not there yet," Strand told the Norwegian news agency NTB. The Yekaterinburg is a Delta-IV-class nuclear-powered submarine that normally carries 16 nuclear-tipped intercontinental ballistic missiles. It was commissioned by the navy in 1985. Most modern submarines' outer hulls are covered with rubber to make them less noisy and more difficult for an enemy to detect. The chief of the General Staff of the Russian armed forces, Gen. Nikolai Makarov, led a team of senior military officials to Roslyakovo to oversee the emergency response. The damage from the fire could be so massive that the submarine would need to be scrapped, the Interfax news agency reported Friday. But Deputy Prime Minister Dmitry Rogozin, who is in charge of the nation's military industries, said after the meeting that the submarine will rejoin the navy after repairs. The Russian navy suffered its worst accident in August 2000, when the Kursk nuclear submarine exploded and sank during naval maneuvers, killing all 118 crew members aboard. A 2008 accident at the Nerpa nuclear-powered submarine killed 20 Russian seamen and injured 21 others when its fire-extinguishing system activated in error and spewed suffocating Freon gas.